When I’m stuck in the greeting card isle of a pharmacy, I tend to freeze up. I know that my choice of card isn’t going to make or break my relationship with another person, but I still want to choose the right one. From Ivan’s charming central conceit is that these cards actually matter a lot. Over the next weeks, you have to choose cards for your job, your family, and even decide what to do on dates with your neighbor, Natasha, in the same way you choose your cards, by choosing from four choices. All the cards you choose lead to slightly different letters you can get from your family and coworkers, and they also branch the narrative. In my first playthrough I went out for a new job I was passionate about and didn’t get it. When I quit my demeaning HR gig, I ended up washing cars—though I had a loving girlfriend who made it a little better. On my second run, I managed to get the job, and so did Natasha. This time I could quit and move in with my new cool girlfriend. My favorite part of From Ivan has to be the greeting cards themselves. They’re as schlocky and unfunny as their real life equivalents, and each time I was presented with a choice I agonized over picking the least awful one. When I sent a card to the wife of an employee injured on the job, I picked the traditional option, which had a sad-looking bee on it and read, “Be Beeter.” That employee later died. His wife was unhappy with the card. 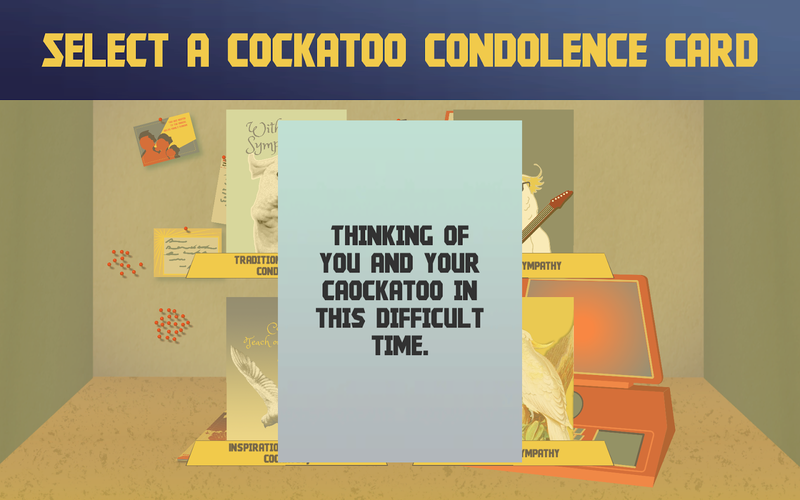 From Ivan is a funny, short game that made me think about greeting cards differently. I don’t think picking the right card is going to score anyone their dream job, but it’s true that even your choice of obligatory papercrafts say something about your personality. Next time I have to pick a card up, maybe it won’t be such an agonizing choice. At least I’ll know not to send an injured colleague a card with a doofy bee on it.